My dogs and I have a lot in common. 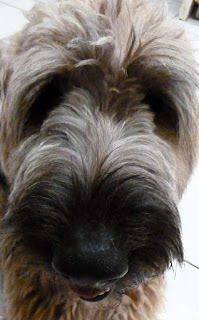 They say that one begins to resemble his or her dog. Well, I think that they begin to resemble us. For example, I have found that my sister's dogs like the things she does, and my dogs like the things I do. 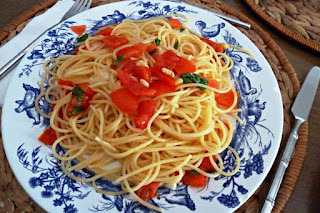 And that is when all the trouble starts... Take pasta for example. I love pasta. I adore it. 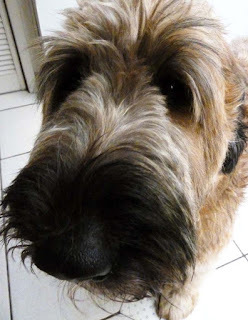 I could eat pasta every day and be a happy woman... and my dogs could eat pasta every day and be happy dogs... So when I make pasta, there never seems to be enough. It's not just the pasta that the pooches seem to relish, but all the various sauces and cheese that go on top of it. You'd think that they would not be into tomato sauce, right? Well you'd be wrong. They adore it, especially when a little mozzarella is mixed in. So when I made this dish recently, there was quite a small commotion in the kitchen. This wonderful plate of tomato, olive oil, truffle oil, tomato paste, wine, garlic, and basil, combined with fresh mozzarella is one of my favorites and my pooches too. I love garlic, and I like my sauces garlicky. I have friends and family who do not feel this way, however. So when you are preparing this dish, adjust the use of garlic according to the palettes present! 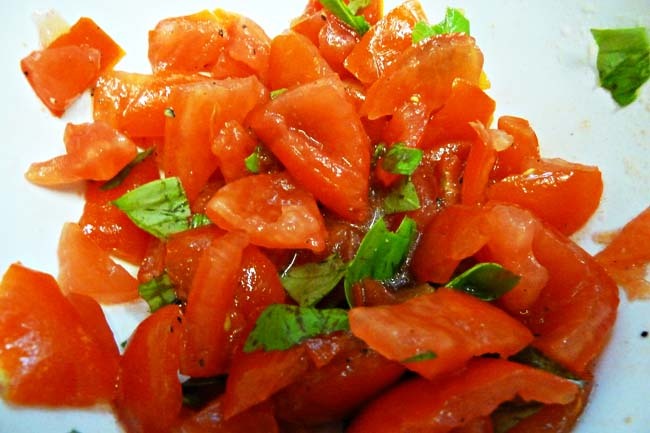 1 pound fresh ripe tomatoes or 1 can of plum tomatoes or a pint and a half of cherry tomatoes. 1/4 cup Parmigiano-Reggiano cheese shredded - or if you're like me more because you like it. 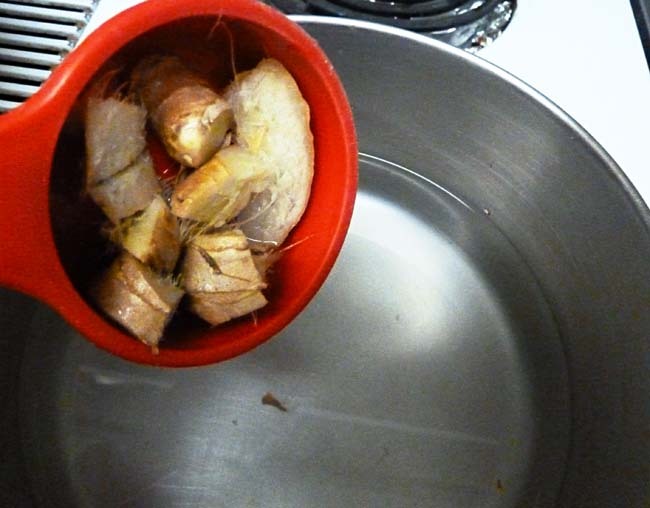 In a pasta pot, add water and salt and bring the water to boil. I don't always blanche my tomatoes, but if you prefer the skin off, you can do so quickly by adding to the boiling water the tomatoes for not more than thirty seconds. 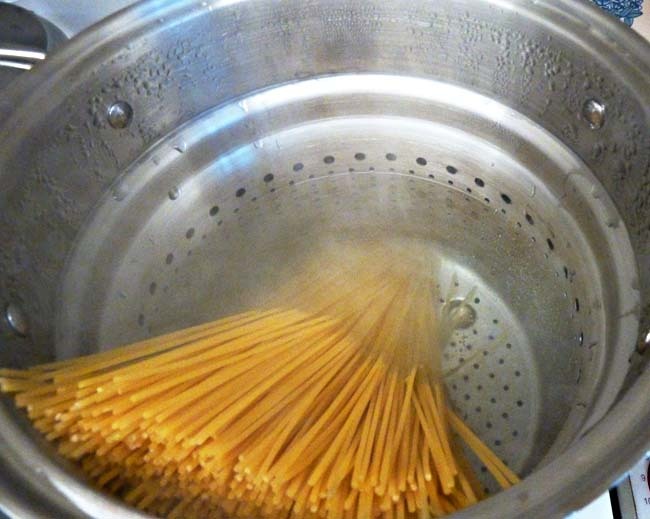 Remove from the boiling water with the pasta basket or a slotted spoon. 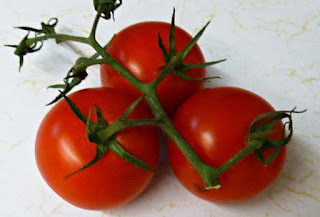 Rinse the tomatoes with cold water immediately and set down. Peel the skins off of the tomatoes. If you're a masochist you can do this with cherry tomatoes, but larger tomatoes might help preserver your sanity. I also just use cherry tomatoes and skip this blanching step. It's worked fine for me. Add your pasta to the boiling water and cook until it is al dente. Reserve a cup of water. Take your garlic clove and with the side of a knife crush the garlic clove. Remove the papery cover and mince it if you love garlic. 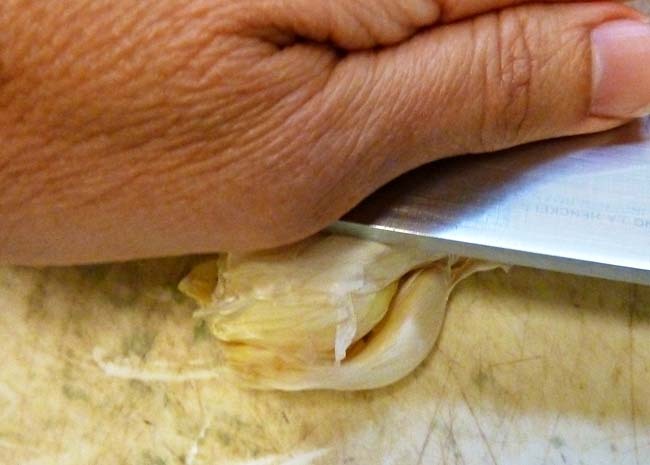 If you like just a hint of garlic, then crush it and drop it into the sauce. 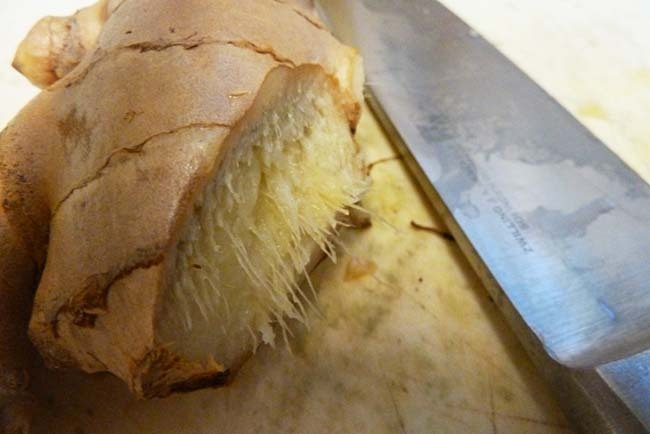 You will remove it before serving and it won't be overpoweringly garlicky. Chop your tomatoes, chop or tear your basil. If you're using cherry tomatoes, then you can just slice them in half. 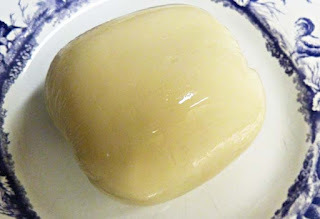 Take your fresh mozzarella and cut it up into cubes. Once of the biggest problems in making this dish is that the mozzarella cheese often melts into the sauce, especially if you add it to a hot pan. Then you get these big clumps of cheese that are reminiscent of The Blob. There is one way to reduce this risk: firm up the cheese. And no, it doesn't have to go the gym. To do this, cube the cheese, spread the pieces on a dish, careful that they are not on top of each other. Place the dish in the freezer so the cheese pieces firm up in the cold. You don't want them rock hard. Just firm enough that they will not immediately melt into the hot sauce when added a little later. About five minutes or so in the freezer should do, but keep an eye on them so they come out firm and don't turn into rock blocks. The next part is fast because you don't want your garlic to burn or your basil to wilt. 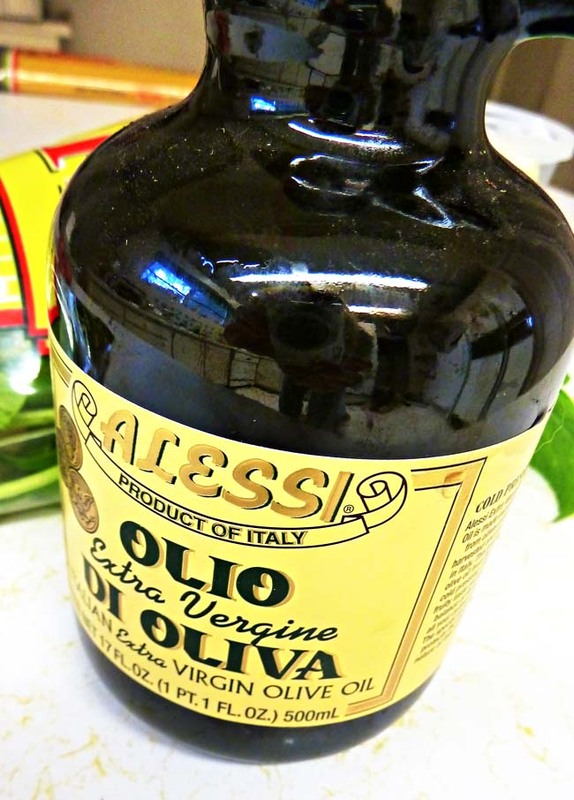 Add your olive oil to a large sautéing pan and let it warm up on medium heat. Once it is warm, cook the garlic for about thirty seconds. If you find it's cooking too fast, move it off the burner and keep cooking. 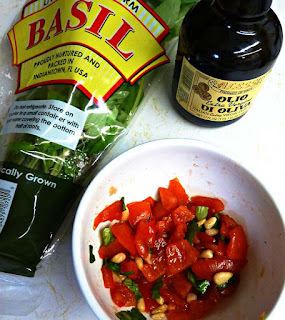 Add your tomatoes, tomato paste and basil. Stir to coat the tomatoes and basil. Add the truffle oil, wine and mozzarella cheese and stir. 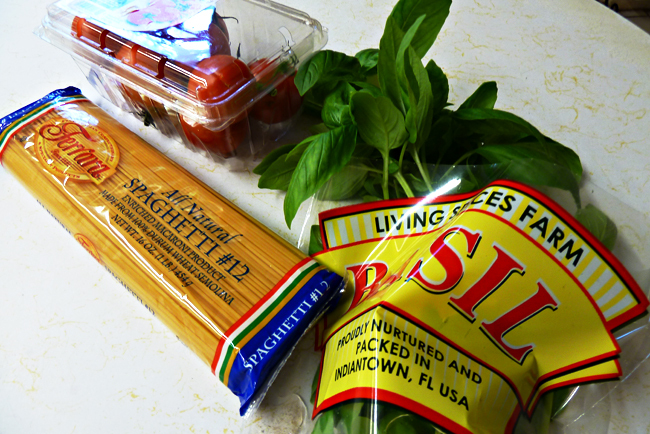 Add in your pasta and mix the ingredients together. If necessary, add a little of the reserved pasta water if the sauce is too thick. Even though this plate has mozzarella cheese, I always like to add a little grated parmesan reggiano to my pastas. The bite that this cheese gives to the plate is unsurpassed. 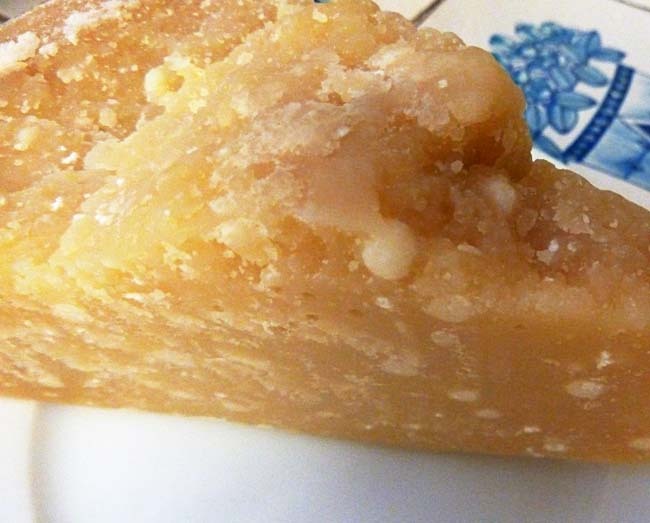 Grate some parmesan reggiano and set it aside to top off the pasta at the table. 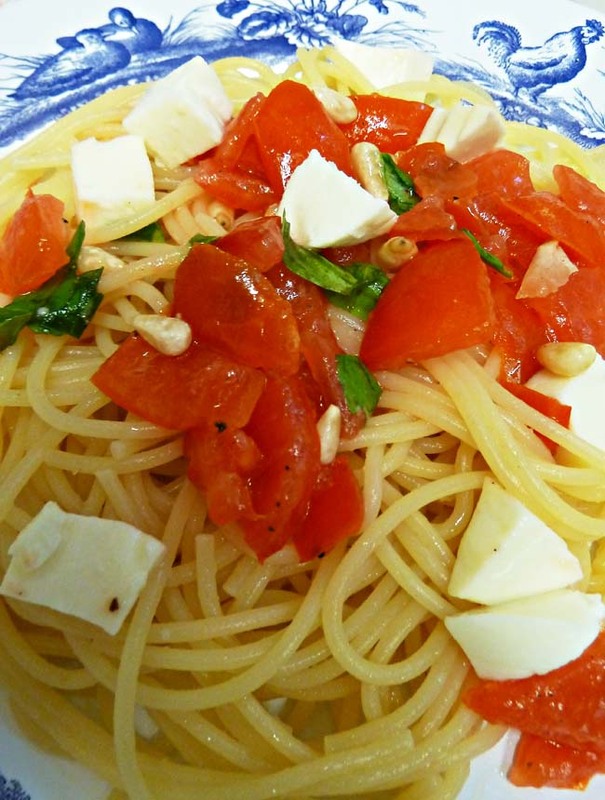 Serve up the pasta and sprinkle parmesan reggiano and enjoy... But try to hide it from the dogs. In my next post, I will show you how a pasta hound like me has turned to spaghetti squash as the "go to" pasta substitute. Just delicious and you won't miss the real thing. Plus you'll get lots of good nutrition and no carbs! And the dogs also love it! Stay tuned. It's autumn. 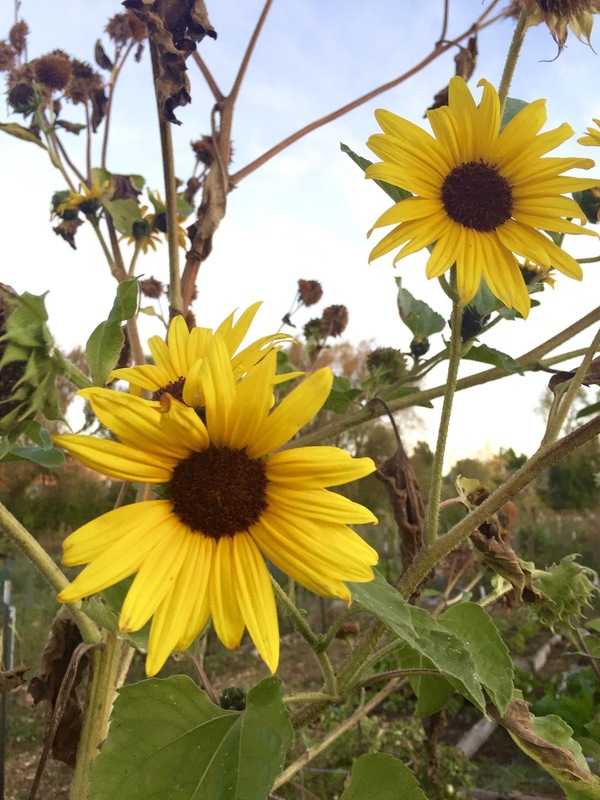 Time for the last of the wildflowers, changing leaves, cooling temperatures... and pumpkins. 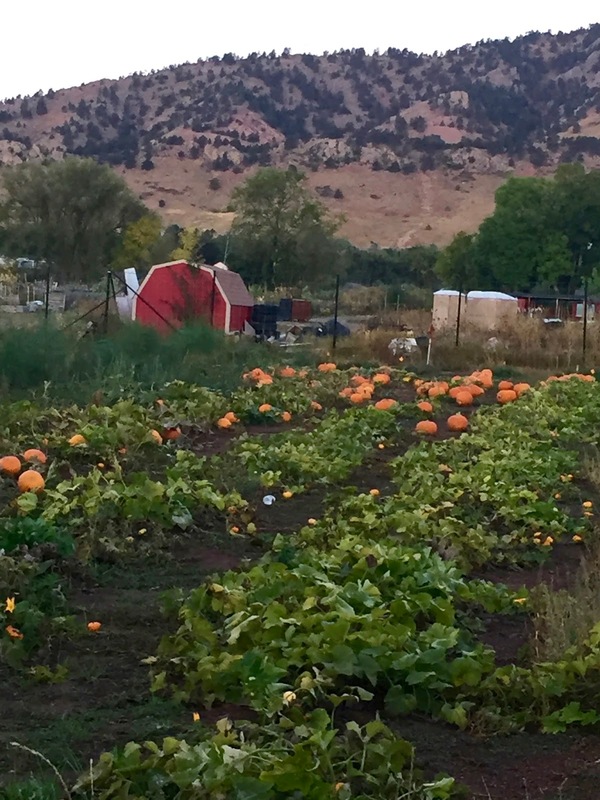 Pumpkins are popping up all around Boulder. Out of the ground, in the supermarkets, in the farmer's markets and on doorsteps. Along with the squirrel in the backyard- or Squirrel as we not so affectionately know her. She makes it a point to eat every squash in sight and everything else for that matter. Nasty beast. But pumpkin is her favorite, just like me. Winslow and Squirrel have been at it all year. So I know that I can count on him to keep Squirrel at bay for awhile, but eventually, she will have her way and eat my pumpkins. I love pumpkin. Pumpkin anything. This year, however, I swore to make my pumpkin treats healthier. Reduce my sugar and sweets intake. No easy feat for a sugarholic. But I am not a radical quitter of the sweet stuff. Moderation is key. Otherwise, what fun is it? 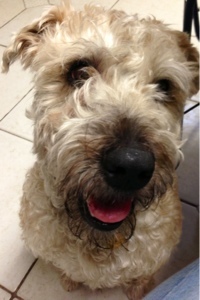 And Winslow, who also likes a sweet treat every once in a while would be devastated if pumpkin pie were made verboten. Yes. He may be a pooch, but he celebrates the harvest with the best of them... like Squirrel. So early in the morning, Winslow and I went to look for pumpkins. 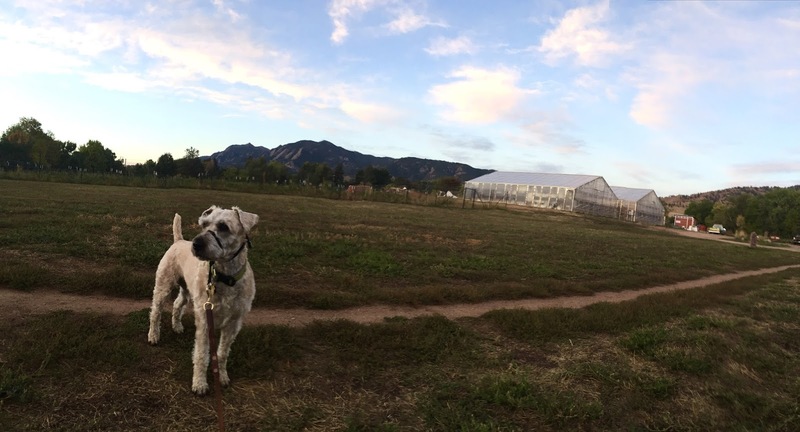 A few were growing nearby at Growing Gardens. Gorgeous patch. But we could only longingly look at them. We purchased ours at a local farmer's stand just outside of town and brought it home. In reading about rare tidbits about pumpkins in the Farmers' Almanac Facebook stream, I learned that the pilgrims used to make pumpkin pie by hollowing out a pumpkin, filling the shell with milk, honey and spices and baking it. That sounded perfect. No crust! No pastry shell. Definitely a healthier solution. A novel new way to reclaim the old tradition. I would bake the sweetness into the pumpkin as I did with other squashes. Now, my only question was: How were the walls of the pumpkin to hold up? I decided to cross that bridge later. What resulted from using part of this technique and some experimentation turned into a tasty, not overwhelmingly sweet treat. But there was trouble along the way... as I fell off the bridge when I came to it. No matter. 1 unbaked pie shell. (That's because of the trouble that I mentioned earlier.... Best unbaked pie shell I have found is a purely organic product sold at Whole Foods.) Follow the directions on the package of your pie shell to prepare for baking. Preheat the oven to 350 degrees. Begin by cutting open a sugar pumpkin at the top, just as if you were going to carve a Jack O'Lantern. Scoop out all of the seeds and save them. I have a great recipe for roasted seeds you'll want to try! Combine 1 tablespoon of brown sugar with ingredients 3 - 7 and drop into the pumpkin. Roll the pumpkin so as to coat the insides well with the spices and sugar. Put the top back on the pumpkin and wrap in parchment paper. I prefer not to cook with aluminum foil so I use parchment paper to wrap all of my squashes and potatoes. Place the pumpkin in the oven on the rack and let it cook for 50 to 60 minutes. Turn on classic Tony Bennett. Get yourself some wine and relax. A perfect soundtrack for this time of year is a golden oldie I discovered on youtube.com. If anyone would have told me back in the day that I would be listening to crooners! Well, Tony is my favorite crooner and I was raised in Florida, which makes it perfectly fine as far as I can tell. And of course Winslow's reaction to the crooner music. Or is he just waiting for pie? After about 50 to 60 minutes - some of this will depend on the size of your sugar pumpkin - take it out of the oven, remove the parchment paper and take off the top. Begin scooping out the flesh... This is when the trouble began for me. My original plan was to mix that flesh inside the pumpkin with the remaining ingredients and bake it until done. Well, as I feared, the pumpkin walls collapsed as I began to scoop out the flesh. And there was no way that all the good stuff would have fit in there anyway. So DISASTER! But oh well... I scooped out the entire flesh and threw it into the food processor. If the same thing happens to you, just remove all of the flesh from the pumpkin as I did and throw it into a blender or food processor. Add the remaining sugar and the evaporated milk. Pour the mixture into a pie shell and, if you want to make the crustless pumpkin pie, pour some of the mixture into a ramekin. Take the pies out of the oven, let cool for a few minutes if you like them warm, and serve with whip cream or vanilla frozen yogurt. 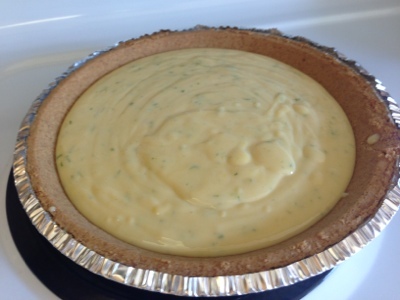 For a tasty combination for the crustless pie open up the center by breaking it up with a spoon up and pour a little evaporated milk. Delicious! In baking the pumpkin with all of the spices and sugar inside for an hour, some of the flesh had an opportunity to cook, so baking time on the pie was cut down. Also, the spices and sugar had a chance to bake into the flesh of the pumpkin longer, giving the pumpkin flesh a great flavor. This recipe is less sweet than the traditional pumpkin pie, but the taste of the pumpkin and spices comes through as does the feeling of autumn. And it seems to have been a hit with Winslow. Now, I just have to keep the windows closed in case Squirrel gets any ideas. 1 pre-made graham cracker crust shell. Plenty of folks skip the meringue or add whip cream to the pie once baked. But the authentic Key West key lime pie is topped with meringue, which is how I like it and so does Winslow Dog. And Winslow is particular about his Key Lime Pie, and a resident of Florida, and would not like a bastardized version of his favorite pie any more than I would. So with ingredient list in hand, off we went to the Boulder's Farmer's Market to get some farm fresh eggs. 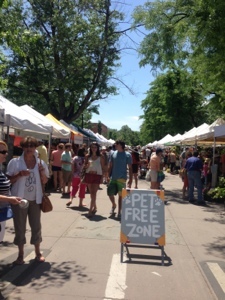 The Boulde Farmer's Market has a great variety of fruit, vegetables, and dairy most of which are locally grown or harvested along with a huge food court section and non-food booths for items such as pottery and jewelry. But I was on a mission: to find my locally hatched organic eggs, which I did find from a wonderful farm woman who let me pick my favorite brown ones. So with eggs in bag, off we went to get the rest of our ingredients at the local grocery stores. The first store we hit was a local Whole Foods, a chain which I happen to be quite find of. But alas, they had run out of key limes. Next, was King Soopers where a very helpful fellow had to do digging around the stock area to find me a bag since they had run out on the floor. I pondered this apparent run on key limes in this area and had to ask myself: What do these Boulderites do with all these key limes?? Are pies being made by the dozens? Are they planning Fantasy Fest West Side? Does the State of Florida really need to take action with its Key Lime Pie declaration? Have that many Floridians moved here and overtaken the area? There are a lot of us around. It was puzzling. But, with little trouble, I garnered the rest of the ingredients, and off I went to bake a key lime pie in the foothills of the Rocky Mountains. It's not that Winslow knows how to bake this pie, but he sure knows how to eat it. And it's because he loves this pie so much, that I've named it after him. This pie could not be easier to make. 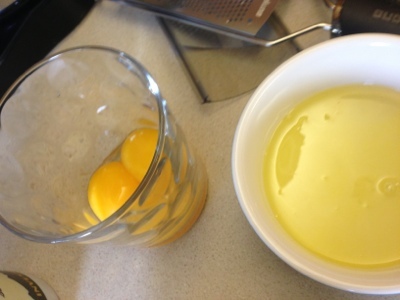 First, seperate the eggs while cold and let the egg whites get to room temperature. Next, wash your key limes really well - I have yet to find organic key limes anywhere. Next, put the prebaked pie shell into a 375 degree oven and bake for five minutes. When done, take out of the oven and set it aside. Before you start squeezing the little limes - and trust me, this is the worst part of this process - grate the skin of enough limes to get two teaspoons of grate. I suggest using a Microplane as it makes short work of an otherwise "grating" task. Set the grated lime rind aside and begin squeezing....and squeezing...and squeezing...until you get 1/2 cup of juice. 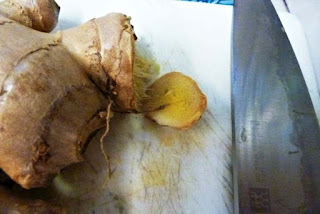 I recommend you squeeze more than 1/2 cup because you will be straining the pulp and seeds. I usually squeeze the whole bag of about 14-16 limes. Now, a couple of notes: Don't use bottled key lime juice! One thing is using the stuff for flavor on chicken. 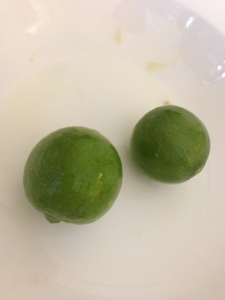 Another is making it the main ingredient in key lime pie! 'Nuf said. Second, moderate how much key lime juice and grate to use according to how tart you want the flavor. I like it tart, as do most of my friends, including Winslow and Kip, my other beautiful boy. But, I have friends who like it a bit sweeter, so for them, I reduce the amount of lime grate. Once you have the lemon juice and the grate ready, put the egg yolks in a blender and begin to beat them until they have a light yellow color. Then add the condensed milk and beat to blend. 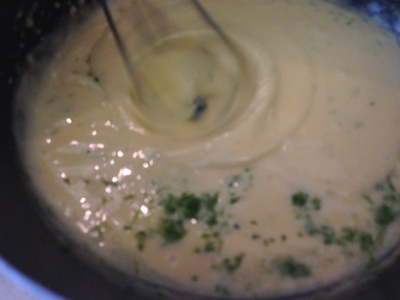 Then, add parts of the key lime juice and incorporate into the mixture. It will get thick. Add the key lime grate and continue to blend. Finish blending and pour the mixture into the pie shell. Place in the center of the oven and bake for twelve minutes in a 350 degree oven. In the old days in Key West, according to Wikipedia, the sponge fishermen, who were perhaps the inventors of this delicious dish, did not cook the egg yolk mixture. However, these days, for safety reasons, we do. Not so great to drop dead eating key lime pie. Remove from the oven once cooked and set aside. Combine the egg whites with the salt and cream of tartar and blend until the eggs are frothy. Then, slowly add the powdered sugar slowly and keep beating until soft peaks are formed. 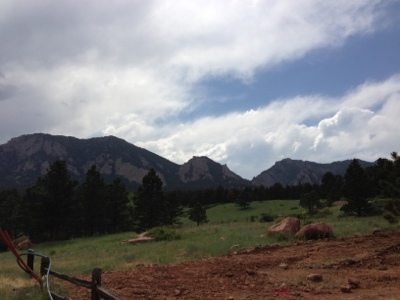 Once that is done, you pile it on mile high so that it looks like a fourteener - a fourteen thousand plus feet tall mountain for you flat landers - and stick it in the oven. Many recipes say that in about ten to twelve minutes it will be done when you set the oven at 350 degrees. I have found that it can take a little longer - 20 or 25 minutes. You need to keep an eye on it. If it gets too toasted on the top, you may want to cover it with aluminum foil. You do want the meringue to be cooked through and not runny. Then sit down, under a palm tree, or an aspen, with your best dog, significant other, or yourself and enjoy! 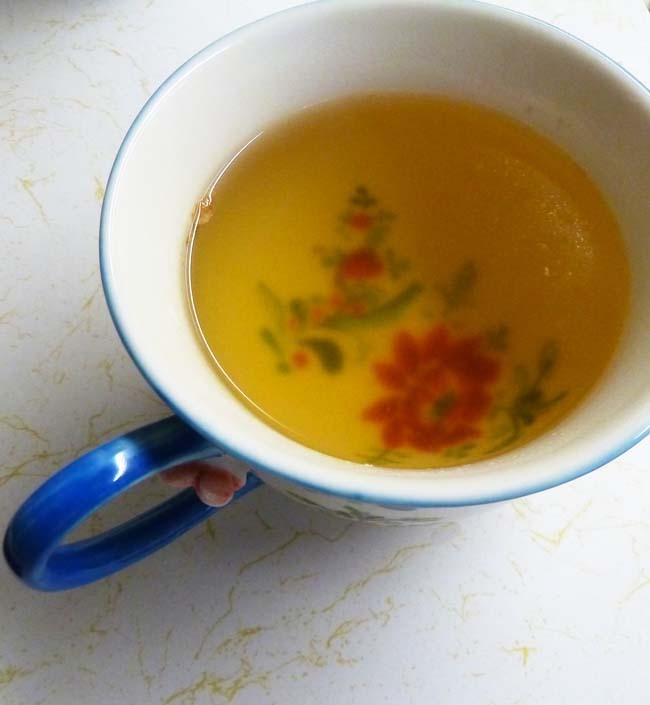 I love herbal teas. I really enjoy trying different spices and combining them into tea. You can do so many things with mint, anise, ginger, vanilla bean, lime rind, lemon rind, orange rind you name it. 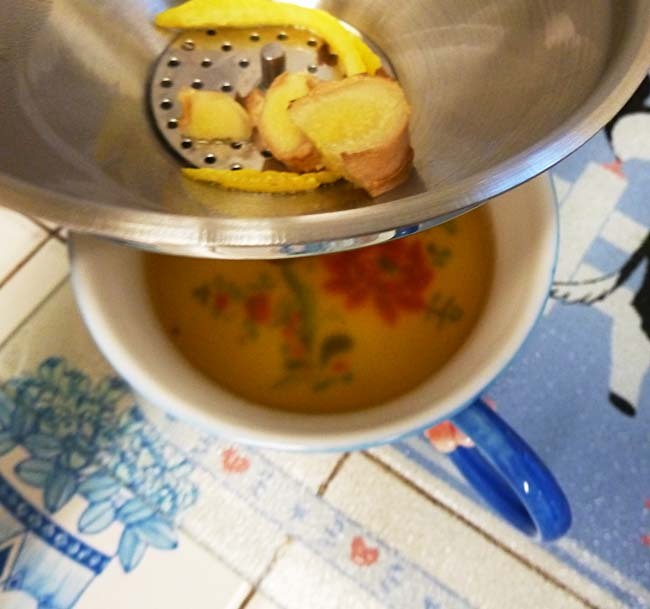 Recently, I ended up with extra ginger after working on my Oh Baby, Baby Carrot Ginger Soup so I decided to make a simple herbal tea. It was a breeze and using simple syrup made it even easier. 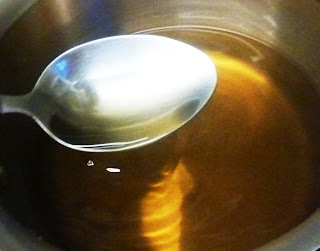 Simple syrup is a combination of water and sugar. 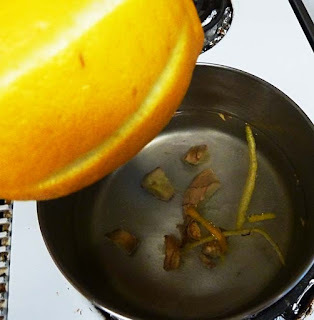 The idea is to dissolve the sugar into the water by cooking it so you have an easy sweetener handy without the bother of trying to dissolve the sugar later. This is a special blessing when serving cold drinks like iced tea or lemonade. In a sauce pan pour the water and add the chopped ginger root. 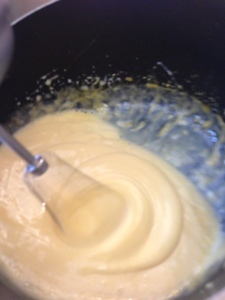 Add the lemon rind to the mixture. Bring the tea to a boil, cover and let it simmer over low heat for about five minutes. 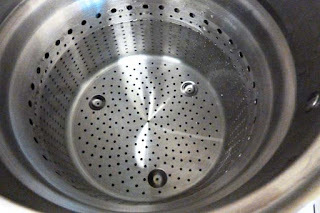 Pour the herbal infusion through a sieve. Add simple syrup to taste. This combination of water and sugar make for a very sweet simple syrup. If you want to make it lighter, you can use 2 cups of sugar and 2 cups of water. 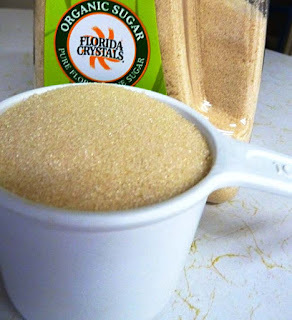 For sugar, I use organic pure cane sugar which has a slightly brownish tinge. When this sugar dissolves into the water, it will have a slightly brownish color. This will affect the appearance of any drink in which you pour it, but I think the taste is wonderful. So the color issue does not affect me. 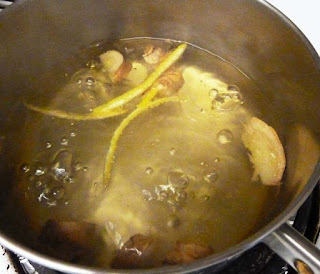 Bring the water to a boil and add the sugar, stirring constantly until it is totally dissolved. 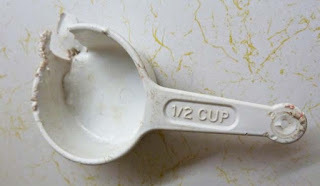 You will know it is dissolved when you bring a metal spoon to the liquid and you do not see any crystals. You do not want to let the syrup cook for too long or it will become too thick. Let the syrup cool, transfer to a bottle, and refrigerate. It's good in the fridge for about a week. There's no one whose company I more enjoy than my dogs when sipping a cup of tea. Winslow was on the bed sleeping, but Kip decided to join me by sitting outside after the tea was brewed. It was already getting dark. It was that time, right before nightfall, when you get to see so many little creatures coming out to work avoiding the heat of the day. 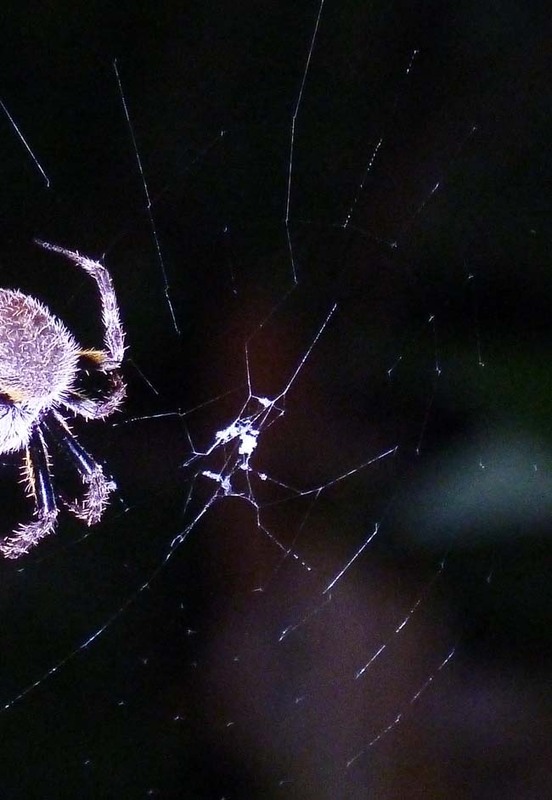 On our avocado tree was a spider that was busy making a web. While I drank my tea, Kip and I sat and watched it weave. I got this shot of it busy at work with my camera. It was a fun night. Nothing like hanging out with your dogs, a cup of tea, and watching a spider spin its web at dusk. 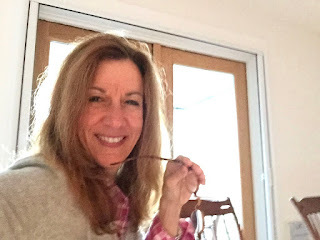 Not long ago, I got together with Em... You'll remember her as the Em from Em's Mom's Hot Fudge Chocolate Sauce. Em and I ventured out to one of our favorite Asian restaurants where they serve this superb carrot soy salad dressing. Now, to say Em is addicted to this salad dressing is an understatement. In fact, she's had this little habit since we were young adults... Now, we're much older adults... 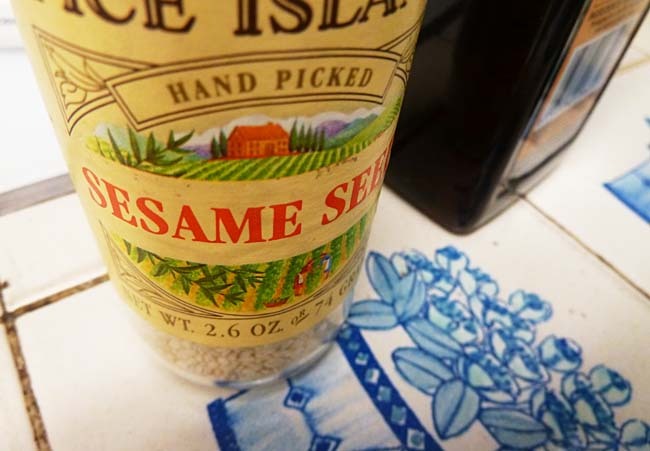 So yes, this restaurant has been around for awhile and for all the years they have been around they have been reluctant to give us the recipe for this dressing...Well, reluctant is not the word. They have downright REFUSED to share. Not so nice. So, we decided that we were going to crack the code of this salad dressing. Now, you may be wondering what all this has to do with Oh Baby, Baby Carrot Ginger Soup. Well, it was in my various different experiments of figuring out how they made the salad dressing that I ended up creating this quite delicious soup! You see, at first I tried to make the dressing with raw carrot, but the color was off. The salad dressing has the distinct bright orange color of cooked carrot, not the reddish orange raw carrot color. So, I figured the carrot must be cooked and in trying to cook the carrot for the salad dressing, I came up with this soup. Well, okay, I still have not cracked the code to the salad dressing, and Em is none too happy with me at the moment, but I did come up with a very tasty soup. This one's for you Em, while I'm working on our research project! In a sauce pan heat the oil over medium high heat. Add the chopped onion. 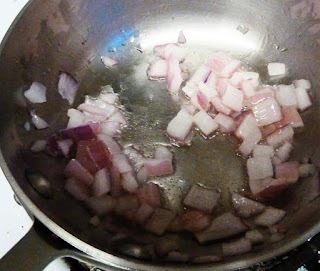 Cook the onions over medium high heat until the onions have softened - they will begin to look translucent. Add the water and carrots and cover. Set the heat to low. Let simmer for about thirty to forty minutes. 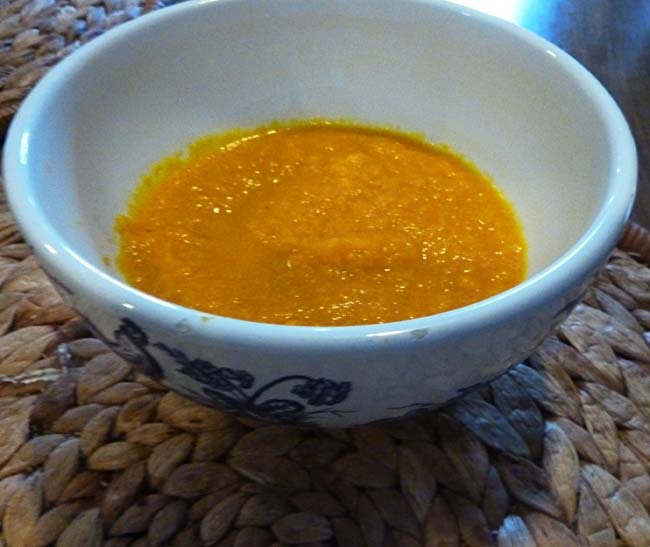 When the carrots are tender, (not mushy) transfer to a blender and liquefy. 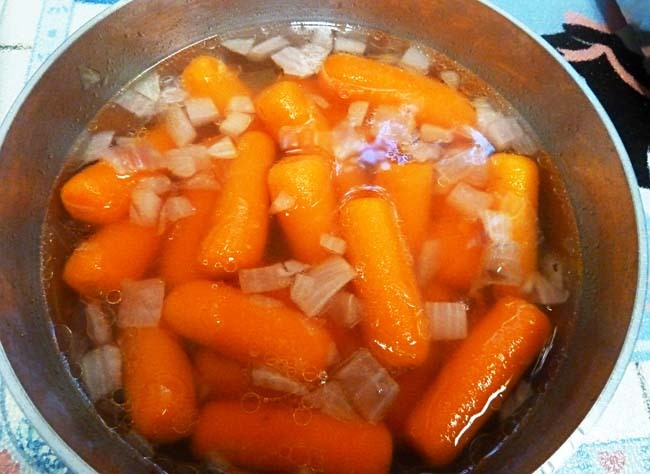 Be careful when transferring the hot liquid and carrots, as they will be very hot. Add the soy sauce, ginger, sesame seeds, and nutmeg. Blend again on liquefy. Serve hot. 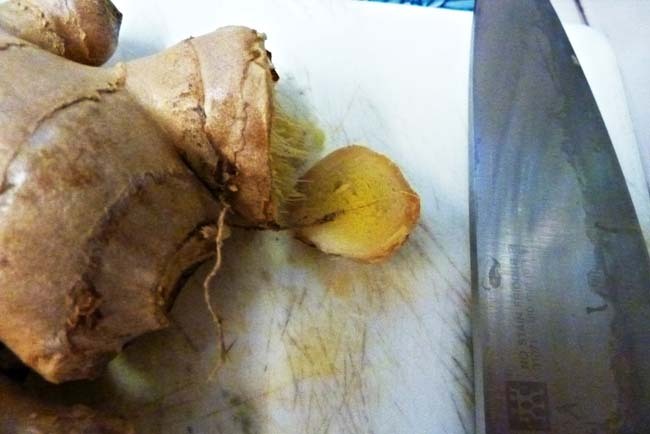 You can garnish with a dab of sour cream or garnish with ginger shavings. Now, while I was busy with all this cooking, Kip decided to join me in the kitchen. He usually hangs out with me while I cook, since his favorite activity besides hanging around with me, is eating. He knows that when I cook, there is generally a treat for him in the offing. I guess he got a whiff of the soup, and it was not something that he would generally eat. So he decided to help. Kip chewed up one of my measuring cups. I have to presume he did this to give me the hint to make something more to his liking next time! He doesn't like carrots much. But it gave me a great excuse to go down to Williams Sonoma to purchase the All Clad measuring spoon and cup set, which I am enjoying immensely. I still have not cracked the code on the salad dressing, but I'll continue to experiment, and who knows what other tasty soups I'll come up with in the meantime!